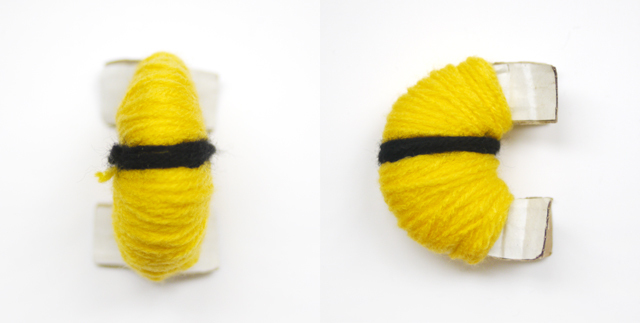 New video tutorials are now available on our new pompom destination Pom Maker blog. After making those flower pompoms, I couldn’t help making more. Maybe it’s called procrastination. I have hundreds of other things on my to-do list, but then this week I thought, well, hey let’s just make more pompoms! 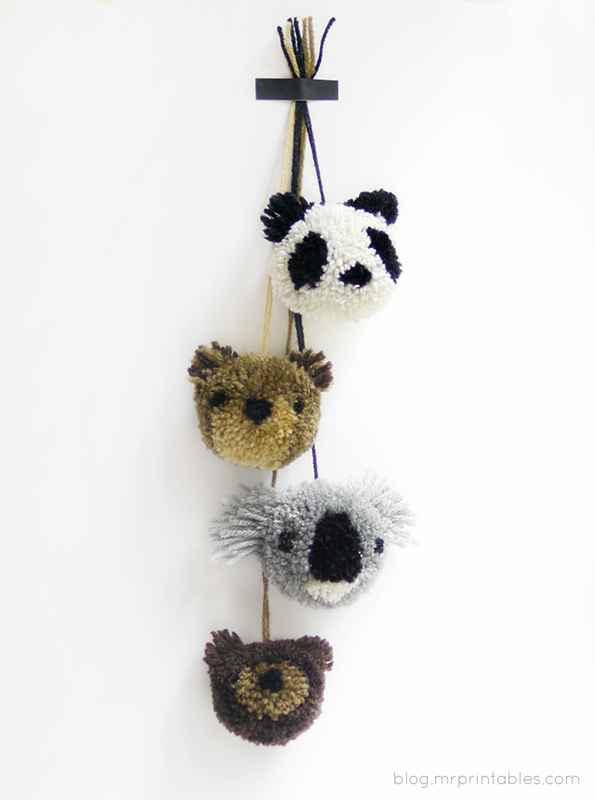 Among many other ideas, I went for having a go at animal pompoms. It’s just that kids love animals most and that’s what matters here on Mr P! They are a little more difficult to make if you’ve never tried making pompoms, so in that case, start with the flower pompoms here then you’ll be able to easily move on to more complex designs. Basically the method is the same. Start with good simple designs that are not too tricky to achieve. Draw your design neatly on paper first so you can follow it clearly. See the flower pompom tutorial if you need to get used to the basic process, because I’ve skipped a few steps in this post. Start with the nose and mouth in the middle, wrap around the surrounding face color on top of this, a little wrapping floating in the middle for the eyes then finishing with more face color. Then you’ll need to make animal ears. 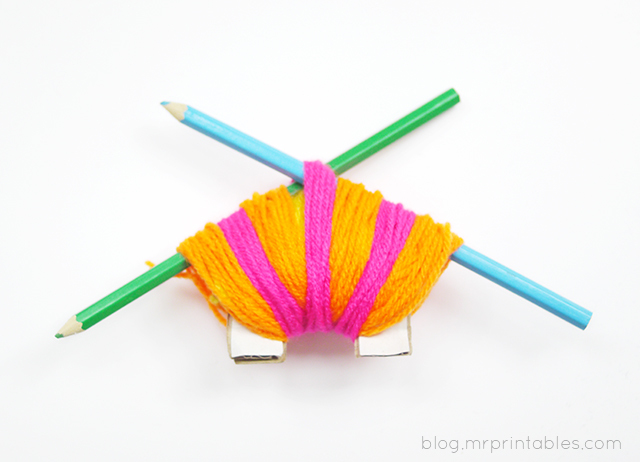 Place a pencil (or your finger) on one end and wrap extra yarn around it a bit like this. Make sure this is the top of the head end, during one of my many dips in concentration I put the ears on the jaw line – you don’t want to end up with a mutant animal. : ( But then pompoms are good to make while thinking about something else at the same time so if it happens and you notice that the ears are in the wrong place when you cut it, just move the longer ear parts to the other side before you finally tie up the pompom. I had a comment from a reader who thought my pompoms looked perfect and hers weren’t. My answer was that it’s all in the trimming. So I took a photo of the animals before the trimming this time. 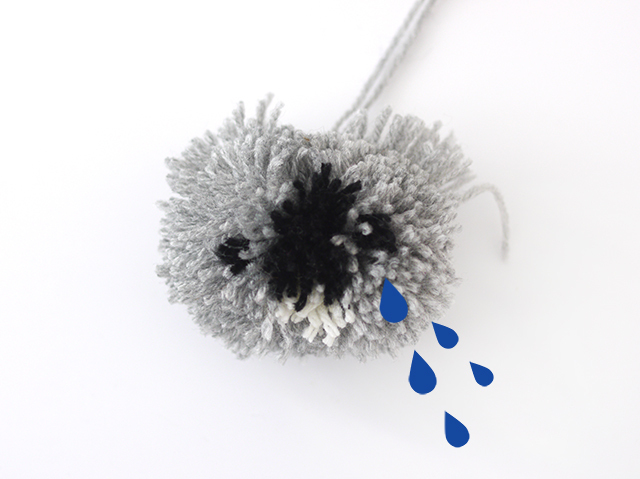 If your pompoms look like this below at first don’t worry! Before the trimming: a sad koala. Yay! 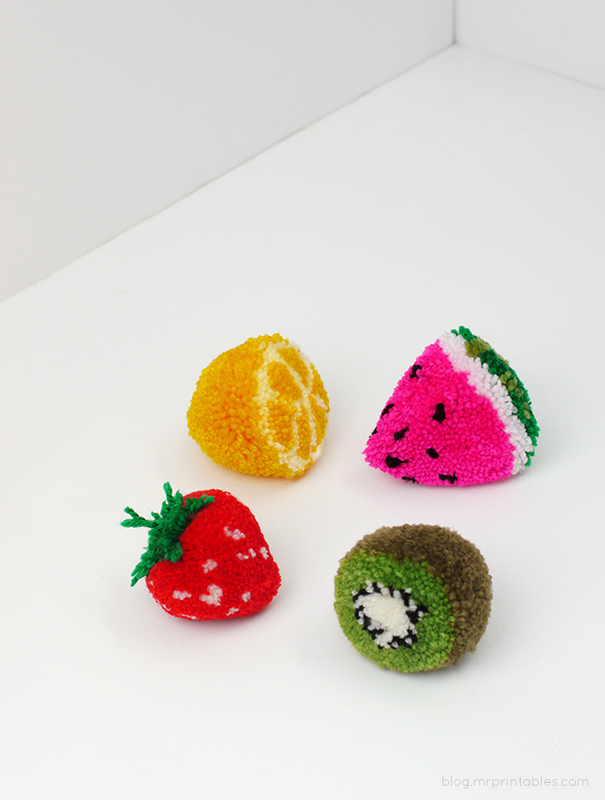 After some careful trimming, your pompoms will find their identity. A happy koala! 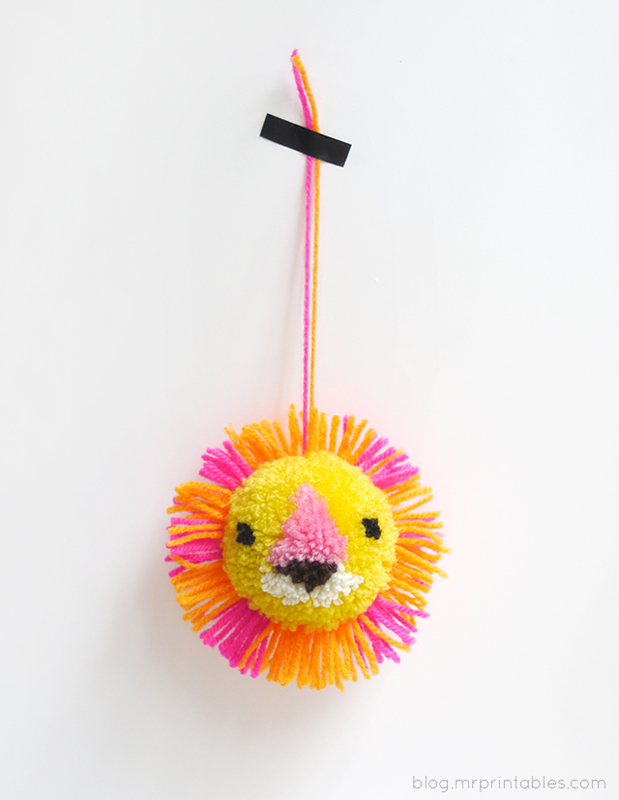 Here are more detailed step-by-step photos showing how to make a lion pompom. The pics show the top & side view of wrapping the nose part and then the white bits around the mouth over the nose. After you wrap some face color all over then add a little bit of black on top where the eyes would be. Then wrap more face color to finish off the whole face. 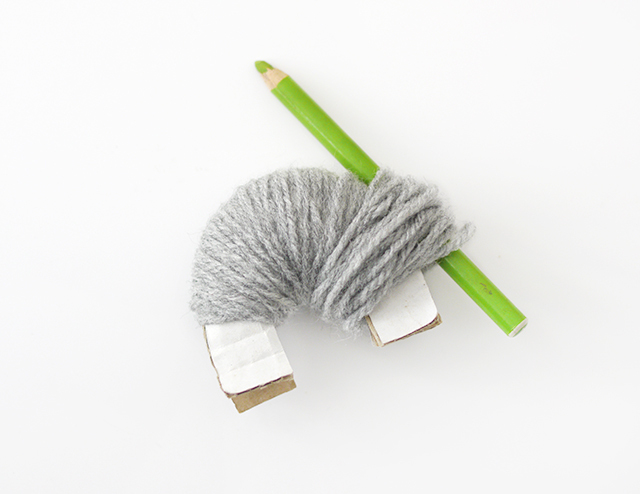 To make the lion’s mane, place two pencils (or anything that works for this purpose) as in the picture so you can wrap longer yarn all around. Take out the pencils and do the rest of the steps to finish. Here again, the lion before you give him a good haircut. And after the trimming. A clean shaven proud lion! I should’ve made male and female lions so they could be a couple, but the mane part is quite fun to add so here they are. Two lion boys – the best of friends! BUAAAA COMO HAGO EL PANDA¿?? ?¿ YO PARA HACER POMPONES USABA EL CIRCULO ENTERO DOBLE, ES LO MISMO¿? And the instructions for the panda?? :O That was the one I wanted to make. This is amazing! did you find it, i am looking for it tto! These are awesome, thank you!! Oh my goodness this is so amazing. I am so super impressed with your skills. This is truly original! Thanks Ally! They are quite straight forward once you try. Of course it took me a few pompoms to get it to work well. Hope you give it a go! This is soooo cool! Really, it’s an unbelievable good idea! greetings from HaBa From Holland! 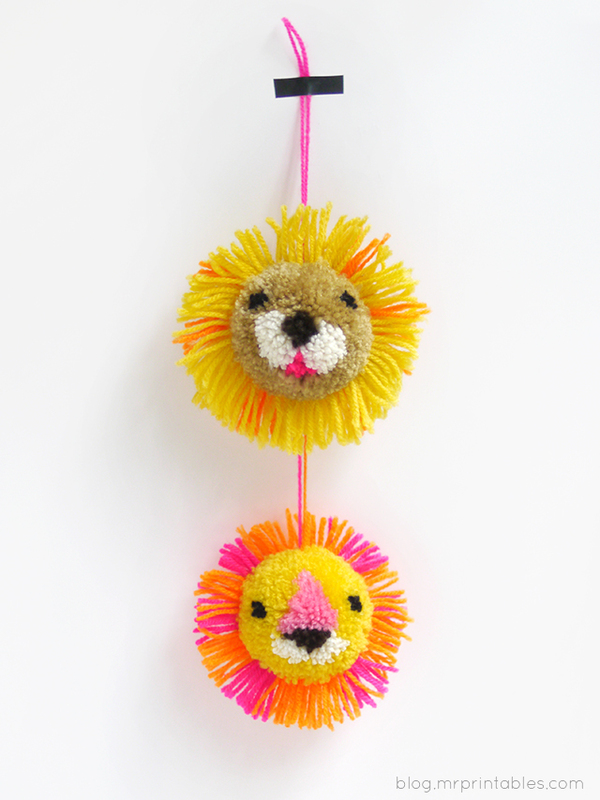 Love these pompom animals. 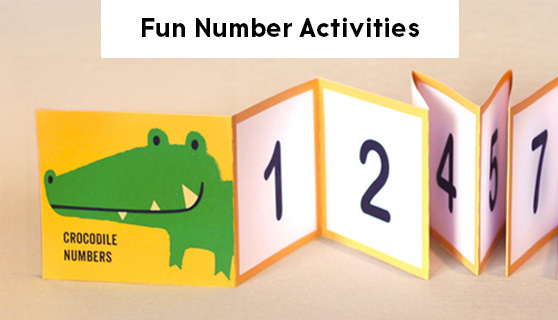 What a great craft for the kids! I hope the kids enjoy them! tried the lion, but used too less yarn.. Will give it a try again. It’s fun! Thank you! Keep going! ^ ^ You’ll have a much better feel for it second time around. These are flippin’ genius. Thanks for sharing the tutorial! oh my. you are freakishly FANTASTIC! i want your brain. i love these and the flowers. thank you for the diy! Thanks – hope you do try! So much fun!!!! You are fabulous for figuring this out and sharing. Thank you. oh my goodness, these are so awesome! I answered the same question below – hope you can find it! Just scroll down to the very bottom. Thanks! Hi, these are so cute! Any chance of placing an order with you to buy some already made animals for a time poor desperate woman who wants to pass animal pompoms on for a new baby present? Hi Anne, I’m so sorry – I don’t have any to sell. ^ ^ I wish I had time to make some available but I’m afraid it’s not possible at the moment. Hope you find nice presents! 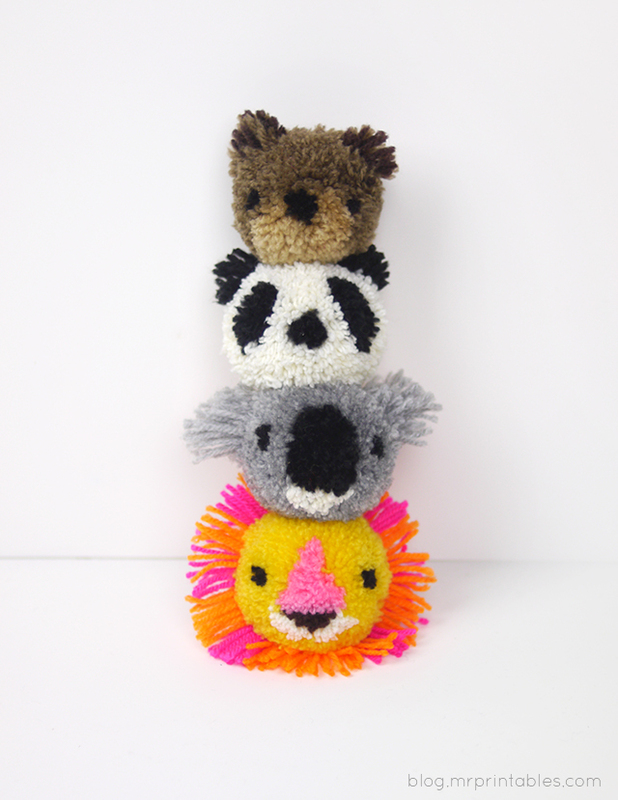 your pom pom animals are really quite amazing! can you think of any way to design a giraffe? i just cant imagine a pattern shape for it…..
how did you make the tiger and the bear??? your post is very adorable! Amazing! So pretty! I can’t wait to have my very own lion pom pom. ABSOLUTAMENTE ADORÁVEL!!! !PARABÉNS PELA BELA SELEÇÃO OBRIGADO POR ME INCLUIR. I’ve tried to make the panda and the bear but… I can’t 🙁 Could you post the tutorial, please? Hi Alba, sorry I couldn’t post step-by-step images for every animal, but tried to explain how to start and use the technique. Hope you give it a try again! yes i need the panda tutorial too! These are fabulous. You do such beautiful work. Thank you so much for sharing the tutorial. 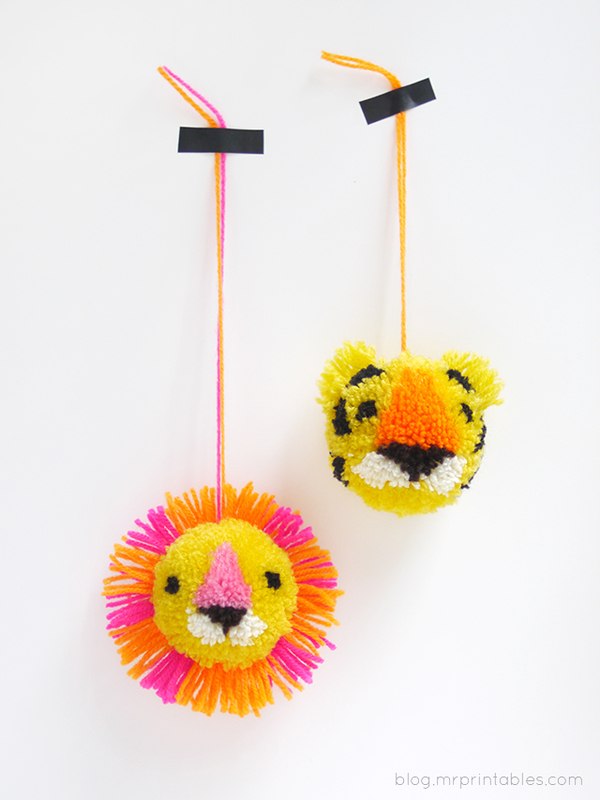 I bought a pom pom maker a while ago for another project but this looks more fun! Now I have to find more yarn! I use a pom pom maker. How and where do you place the colors for the face to give the animal its features.please send to my email ..
Love this, had to share…one day I will try this! Absolutely amazing! 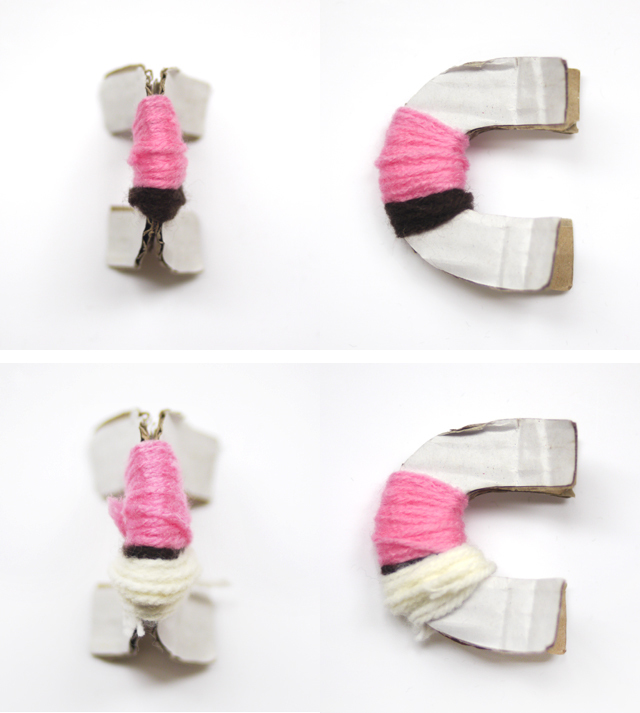 Great way to use up small scraps of yarn. Your direction are wonderful. I will start with a flower and then must make LSU tigers. … “Mister PRINTABLE”… un site enchanté !!! MERCI ! MERCI !! MERCI !!! Wow, amazing idea ! Thank you ! I tried the bear, it almost turned out as a bear, I will try it again (I messed up the ears). I do have one question though : how do you if you’ve put enough wool, when do you sop wrapping face colours around everything and around the back part ? Thank you so much for the tips!!! That’s just amazing. I just tried making pompom flowers today and came across this. I will definitely have to try this out! I love this so much! I think this weekend I’ll try to make some jack-o-lanturns for Halloween!! ail this be the same for the koala? Thank you so much for the diagram!!! Now, I can try doing it to! Could you up load a video? will this be the same for the koala? Thank you for your beautiful and interesting panda can you teach me how can I do after finishing sawing before take out? Do you have a blog? Thanks for the diagram it really helped. You’re very welcome! I do not have a blog, I’m more of a reader. I’ve been thinking to make diagrams for other animal pom-poms if people would like it. Have a great weekend Harriet! It would be amazing if you could do more diagrams. Have you tried to make the lion yet? Shame I kind of hoped you would have a pompom inspired blog I could follow. Hey Harriet. I made a diagram for the lion, the picture is posted as a comment. Now I’m trying to make a diagram for the tiger. Maybe when someone makes a succesful pom-pom animal, he/she then can do the others as well. I’ll put the lion diagram here as well. Hope you’ll like it! Hi. I love the instructions of the panda! Can u make a diagram for the tiger please? ? lovely!!! do you happen to have a video? 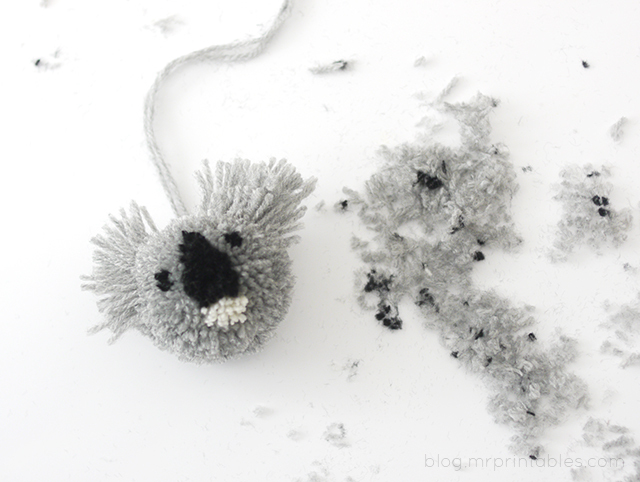 I want to make soot sprites for my son’s 2nd birthday party and I think they would be darling like pom poms. I get the basic concept but I don’t know how you get from the wrapping the yarn to the untrimed stage 🙁 How do you tie it? It would be great if you could share some more tips on trimming. I tried making pompoms using your technique but was not able to trim them properly. A video could help. Would I be able to make a pom pom bunny if I used a triangular object to do the ear wrapping? It would be great if you could share in more detailed the dimension of your cardboard and exact place where you fold it. My pom poms are getting pretty big. Also it would be nice to know how many times you go around with the yard on the cardboard. How do you do the tiger ? do you have detail steps? 🙂 this is really cute! Yay! Thanks for sharing Aurélie, that looks brilliant! I wouldn’t call it a failure, it’s a perfect lion! These are awesome!! I love them. Do you by chance sell them? I love these! Do you by chance sell them? Could you upload a video or specific pictures of the making of the kohala? This is the first time for me seein this art!! But how do I take the yarn/pattern from the tube/cardboard? With pics would be a good idea! Thks! Please tell me what weight yarn you use. @disqus_cDZF5CQdRq:disqus @carolannelawless:disqus I don’t know the exact weight but I use what’s labeled as DK (Double Knitting) wool yarn! Hope this helps. Thanks! These are crazy cute. I decided to use my big Clover Pompom maker to make a jumbo sized pink and yellow panda with some leftover yarn. The pattern even translates to BIG poms! Here’s my first try! He turned out so adorable I had to share. It is definitely all in the trimming. Since I had a big pom (2.5″), I could contour his head a bit. Do the pompoms have two faces on them? Wow!It’s very Good! 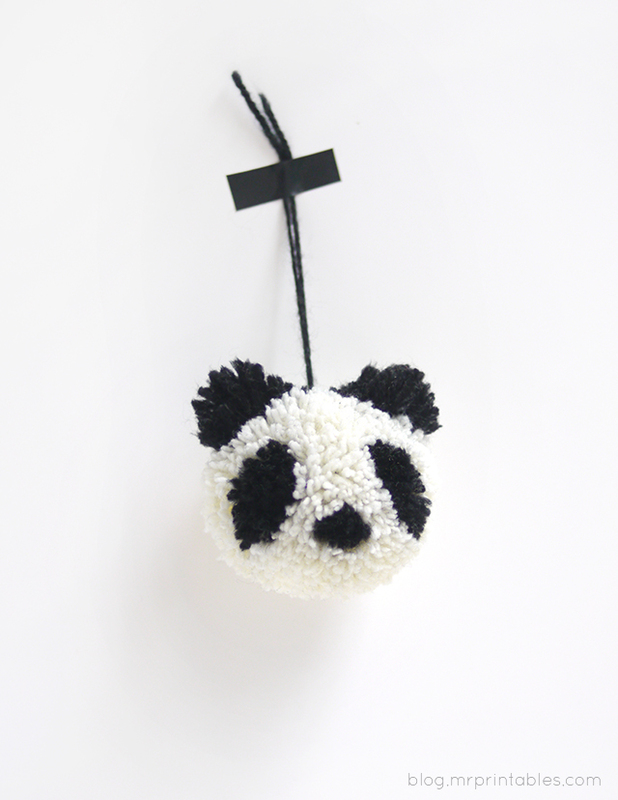 I wish I could make a panda.Could you put me how to make here? Please be advised. My OH MYYYY!! I have wandered into very dangerous territory, I can see clearly!! I shall be buried in adorable pom poms in the very near future!! Your creations are FABULOUS!!! Thank you so much for sharing your talent with us all!! I think this is such GREAT FUN!!! 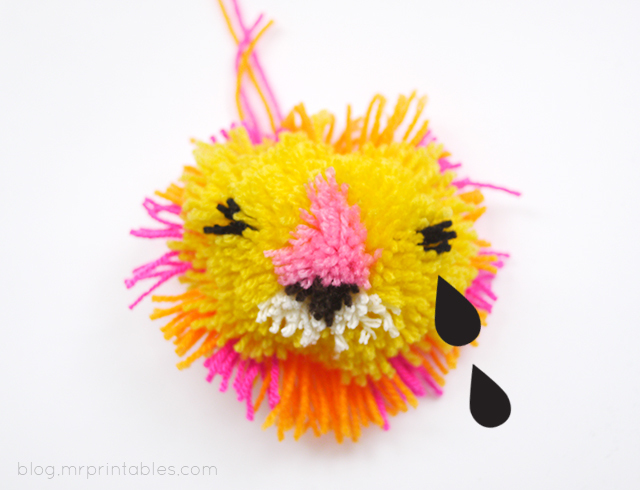 I have made plain ol pom poms for many years, but never anything as WONDERFUL as these ADORABLE characters!!! BRAVO!!!!! Here’s a diagram for the lion! I was able to do the panda & am addicted! Hopefully I will understand the concept to create my own, but I am having trouble figuring out how it looks round! My mind doesn’t work that way! I like so much. Thank you from Thailand. These are adorable! I also really enjoyed reading through the comments and seeing all the other ones people made. Wow, how cute is that!! 🙂 Thanks for sharing! I usually don’t get really interested about craft projects (I am not too good at it) but these cuties and your flowers made me get all excited to start making some!! I have tried thr panda and lion, I still need to practice alot until I get them as cute as yours! My daugther loved them even though they aren’t perfect (she’s almost 3 yrs old). Ce serait dommage d’avoir tissé pour rien ce lion (pauvre de lui ! ), du coup, je mets en ligne sa dépouille ! Thank you so much for these great tutorials. 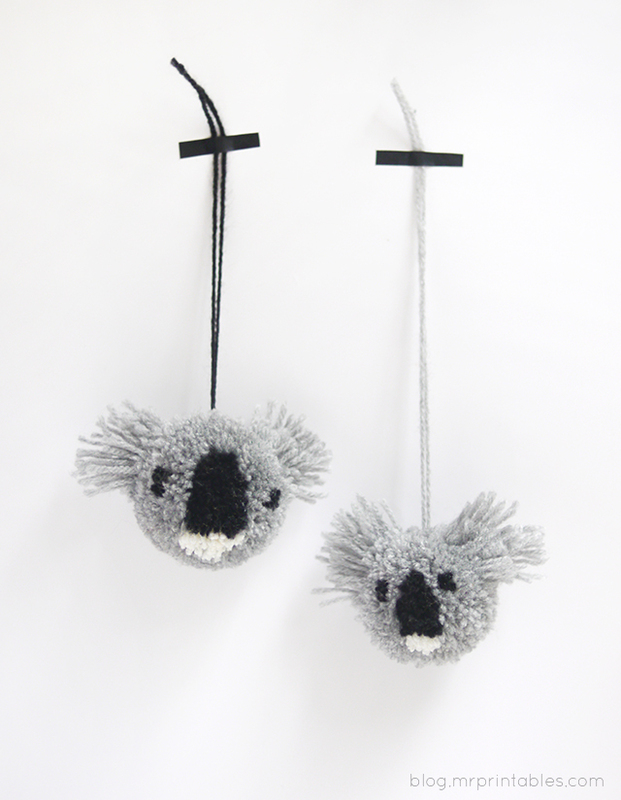 I have had so much fun creating these little animals.. My first one, the Koala is a bit upside down but not bad for first go. The Lion is much better but I need to work on getting the eyes in the right place. You have also inspired me to make my own creation, a Fox. I love it. Super cute! Thanks so much again! your fox is really cute !! 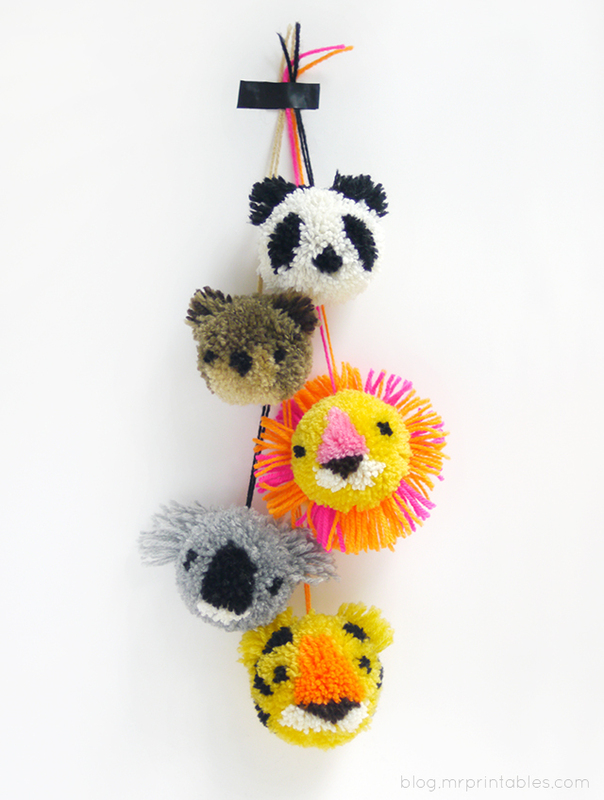 I’m waiting for my pompom machine to try all these animals ! But how you trimm it so well? Hi! I love these pom poms. they’re adorable! I made a lion ….. Can you please show me the process for a tiger? thank you for sharing and for the diagrams !! very nice and sooooooooooooooo cute !! I’m waiting for my achine and I absolutely want to try !